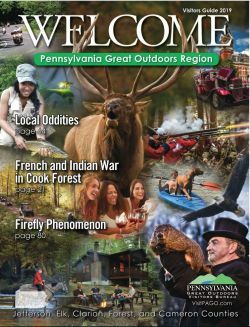 In the Pennsylvania Great Outdoors region, you can see elk in the wild, hike among some of the tallest trees in the northeastern United States, visit a world-famous groundhog, find intriguing history, paddle down two of the most spectacular rivers in the country, and sample the area's many flavors at unforgettable wineries, breweries, distilleries, and restaurants. The old-growth woods of Cook Forest State Park bring many families back year after year to hike beneath the ancient hemlocks and pines, bottle-feed deer fawns, climb a fire tower and giant boulders, and much more. Wild elk roam freely here, and during the fall rut, you may see long-antlered bulls fight for mating privileges. The state-of-the-art Elk Country Visitor Center in Benezette serves as an excellent starting point for an elk viewing adventure. 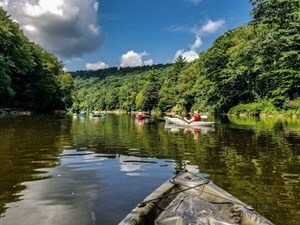 The Allegheny National Forest as well as the National Wild and Scenic River System's Clarion and Allegheny Rivers offer top-notch outdoor recreation opportunities, along with several other state parks that highlight the natural beauty of the region. Each small town here offers unique charm and events, such as Punxsutawney's Groundhog Day, Clarion's Autumn Leaf Festival, Emporium's Weekend in the Wilds, Benezette's Elk Expo, Marienville's Winterfest, and many others. 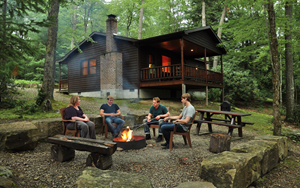 Lodging options range from cozy cabins in the woods, historic B&Bs with plenty of personalized charm, convenient hotels and motels with all the amenities, luxurious lodges beneath the trees, and more.